Calls for a ceasefire in Syria, outlined in a UN Security Council resolution urging a 30-day truce, were apparently being ignored Sunday in the besieged suburbs of Damascus. "It's still too early to judge whether there is any improvement in the ground. There have been reports that the bombardments have continued," said Paul Donohoe, the Beirut-based media officer for International Rescue Committee, an aid group. He said colleagues inside eastern Ghouta, where the government of Bashar al-Assad began airstrikes on the rebel-held enclave near the capital last week, have told him they are "living in constant fear" and are worried over when "the next bomb might hit." In passing the resolution Saturday night, the Security Council did not make it clear when the truce should begin or which areas are covered. Instead, it only called for a ceasefire to be implemented "without delay." "This truce is useless," said Hikmat Sahabi, a lawyer from Damascus. "I mean after 30 days, everything will return to the way it was." Iran said pro-Damascus forces would press ahead with attacks on eastern Ghouta, an insurgent enclave near the Syrian capital, as ground fighting continued. Anti-government rebels said they clashed with pro-government forces near Damascus on Sunday, as rescuers and residents said warplanes struck some towns in the eastern Ghouta pocket, with two airstrikes late Saturday, shortly after the resolution was adopted. The Syrian Observatory for Human Rights said airstrikes and artillery killed nine people and injured 31 in the eastern suburbs. The U.K.-based monitoring group said Sunday's bombing was less intense than attacks over the past week. The latest escalation by Damascus and its allies has killed more than 500 people in the enclave over the last week, the Observatory said. The dead included more than 120 children. Iranian General Mohammad Baqeri, whose government backs al-Assad, said Tehran and Damascus would respect the UN resolution. But the Iranian military chief of staff also said the truce did not cover parts of the Damascus suburbs "held by the terrorists," the Tasnim news agency said. Turkey launched an assault last month on Afrin, seeking to drive out the Syrian Kurdish YPG militia which it deems a menace along its border. While Moscow supported adopting the resolution, Russian UN Ambassador Vassily Nebenzia cast doubt on its feasibility. The resolution does not cover militants from the group Islamic State in Iraq and Syria, al-Qaeda, and the Nusra Front. Baqeri said Iran and Syria would adhere to it. 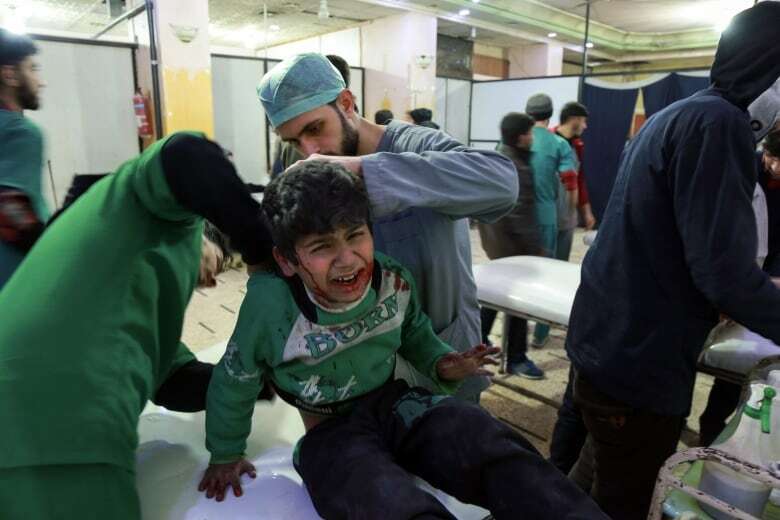 But "parts of the suburbs of Damascus, which are held by the terrorists, are not covered by the ceasefire and cleanup (operations) will continue there," Tasnim quoted him as saying. Pope Francis described Syria as "martyred" on Sunday, calling for aid access and an immediate end to violence. "All this is inhuman," Francis told tens of thousands of people in St. Peter's Square for his weekly blessing. 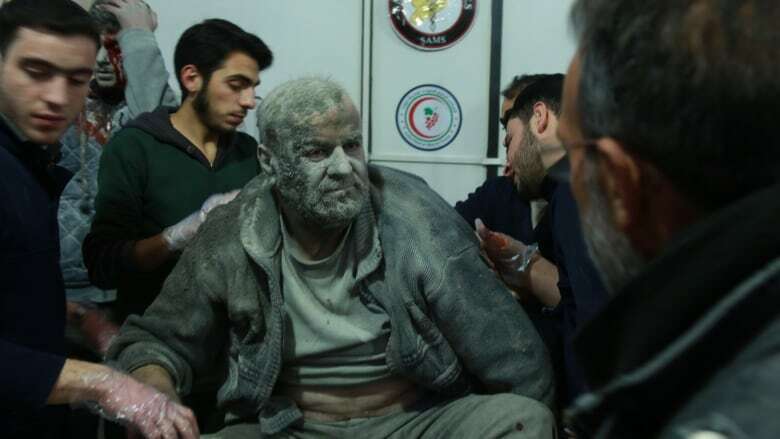 First responders in eastern Ghouta rushed to look for survivors after air raids on Beit Sawa and Saqba, said the Civil Defence service which operates in rebel territory. A witness in Douma said warplanes were still flying in the morning. People have holed up in basements to hide from the airstrikes in recent days, and medical charities decried attacks on more than a dozen hospitals.